Buying properties in Barcelona - prestigious and profitable! Besides the high quality of life, sustainable economic and political situation, Spain is interesting for its coastlines with magnificent scenery, for its rich medieval architecture and deep history. The country has cities that combine the rhythm of the metropolis life and features of a relaxing spa. Barcelona is just one of those towns. This city - the personification of luxury real estate in Spain. Barcelona is the second most populous in the country after Madrid, it is located in the north-east coast of Spain - Costa Brava. At various times in the territory of this town lived and worked many famous musicians and artists, and today many celebrities prefer to have their properties in Barcelona – for vacation or residence. Buying real estate here – a prestigious acquisition. The Mediterranean climate and warm winters give reason tourists to come to Barcelona not only in summer, but also in winter. In other words - the city is comfortable not only for recreation, but also for residence. This famous city is even more popular than the country's capital. The fact that it is among the top twenty best university cities in the world - a guarantee that you will be able to give your children a decent education. Everything indicates that the acquisition of real estate in Barcelona - profitable. It will provide you with year-round demand for rent - students, businessmen and tourists in the city are constantly rented accommodation. The cost of property in Barcelona - the highest in Spain. But according to European standards - prices are low, especially when compared to other prestigious countries. Prestigious apartments with a large enough area, in decent neighborhoods - this is already another price category. The most accessible in terms of price real estate is concentrated in Eshaple region. Properties from the owner in Barcelona are always a chance to buy a home there at relatively affordable prices even in the more prestigious areas. 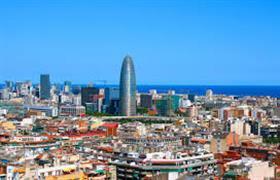 Buying a property in Barcelona, as well as in the whole country for foreigners is not difficult at all. By purchasing a property in Spain, foreigners can apply for short-term visa "C", which will give the right to stay in the country up to 90 days in each half of the year. The national visa «D» category gives the opportunity to remain in Spain more than 90 days.